The adult division of this year's Midwinter Art Contest was very, very competitive. There were many fantastic entries from talented artists in Brazil, England, Finland, Germany, Poland and the USA. It's wonderful to see myths and folklore moving people in so many different places around the world! I would again like to thank my fellow judges Simon Coleby (comics artist for 2000 AD, Judge Dredd Megazine, Lobo, Punisher and much more) and Dr. Kendra Willson (researcher at the Turku Institute for Advanced Studies at the University of Turku in Finland) for all the time they spent considering the entries and for their thoughtful comments on all the works. The adult division was particularly difficult to judge, and I really appreciate the work Simon and Kendra put into this. Congratulations to the winners! The assignment was to create a piece that somehow related to the character and legends of Frau Holle. If you're unfamiliar with this figure of folklore, click here to read more about her in the original announcement of the contest. These wonderful artists each created works that show unique visions of the source material. This year's winners really show a very high level of creativity and skill. Each one of them could have won first place; placements reflect the combined scores of all three judges. Up in night northern skies, she sits on her throne of icy diamonds – the Lady of the Winter, the goddess of heaven. Her silver crown is adorned with silver stars, lighting up the night, and the silver spinning wheel spins new shiny threads of maidens' destinies. Gentle white feathers surround her as they softly fall, swirling to the earth, transforming into snow, for she is it's keeper. The idea of Frau Holle / Lady Winter I got from several sources, the first one was where she was mentioned as the Lady of Heavens. So I painted her sitting on her shining ice throne above the clouds. 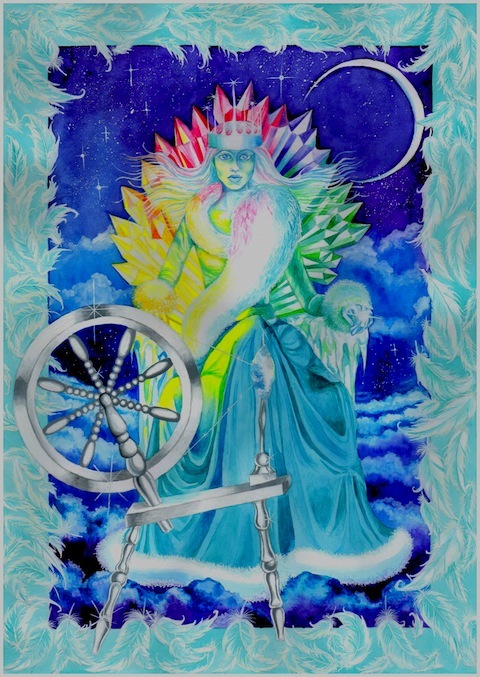 The silver spinning wheel is coming from the reference of her being a spinning-wife, so I imagined a silver spinning wheel spinning on it's own a thread of the destiny as the Lady is watching the process. And of course, I couldn't resist to frame the picture with feathers as it is mentioned in several stories I used to read, too. The colors used in the throne are what I have seen in northern lights around here. Maria has created an absolutely gorgeous work of art. I truly love the thought she put into this work and the wonderful way she combined research and personal experience. Congratulations on a beautiful piece! Simon says, "This is a superbly conceived and executed painting. The composition is very strong, and it's a striking and captivating image. I especially like the way the prism of color in the ice of the throne is picked up in the painting of Frau Holle, herself. That almost suggests a transparency in the figure, which adds a subtle, intriguingly ethereal note. The feathers framing the piece are a perfect touch, and they are very well rendered, indeed." Kendra comments, "Nice decorative design. I like the frame of feathers and the rich textures that both contrast and blend. The red and yellow highlights in a primarily blue composition are striking. The figure looks strong and determined. The complex iconography reminds me of medieval paintings of saints. This would make a stellar postage stamp!" Level 1: Frau Holle is a teacher. She guards what is good and punishes the bad. Her eyes see everything, even what you hide. She is an old woman and very experienced. She evaluates everything right. Level 2: A woman who is like a ghost, Frau Holle is everywhere – even when you do not see that she sees you. You must be on guard! Level 3: Frau Holle always reminds me of Adelaide. Adelaide is my great-grandmother. She was born in East Prussia (Ostpreußen), a land that no longer exists. She watched everything that was "sehr gut," as she would say. She was very demanding. She taught me the laying of bed linen and chided me very much for that reason. Adelaide died long ago. She passed away, as did the land from which she came. Now it reminds me of how our life is fleeting, like those goose feathers in the wind. I love everything about this work. As the son of someone whose German village has likewise vanished from the earth, I truly feel the power of what Ida writes. I also love the idea of portraying figures of myth and folklore with a contemporary appearance, which makes them come alive to modern audiences in a very different way than presenting them in traditional clothing. Wonderful! Simon comments, "I think this painting is quite excellent. It's fascinating to take a mythic archetype, and transpose it into a contemporary context. In this case, it has made for a very captivating piece of art. I love the enigmatic expression of the lady's face. She looks strong, and perhaps a little stern, but she doubtless has stories to tell. The interaction with the feather adds a touch of magic, which invites the viewer to ask questions. A simple, strong idea, superbly executed. This is a very successful piece of art." Kendra writes, "Striking realistic portrait. A challenging gaze and a strong woman with a lot of secrets. 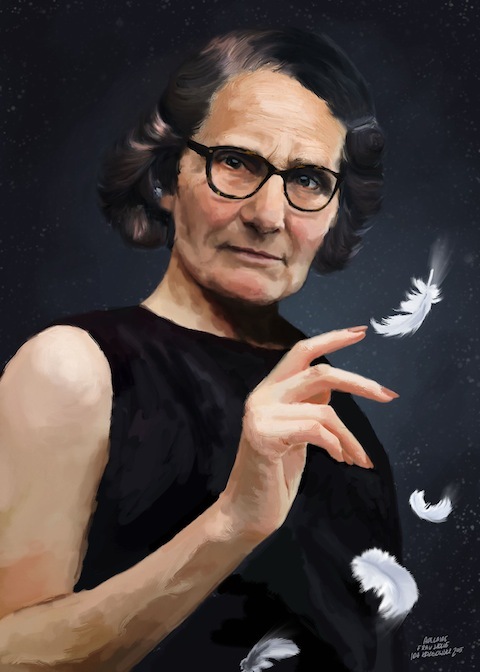 Dynamic hand (younger than her face) touching the feathers." Frau Holle like a powerful goddess of the sky: I was delighted with the transformation of a deity to a character of fables. I chose the first aspect as goddess. I tried to avoid the old illustrations and also the characters of Marvel. Gods have no form; they assume forms that sometimes we can recognize. That's what I tried to do. Jorge has such deep insights into the nature of mythology and folklore. I love his approach to portraying deities. He has created a truly visionary work. 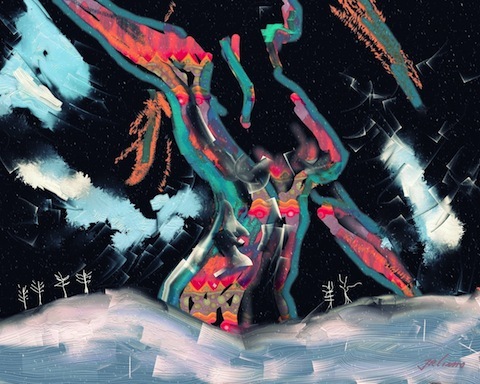 Simon says, "This is a very strong, energetic painting. Rendering the figure to resemble the Aurora Borealis is a powerful idea. This has the feeling of something cataclysmic, and quite awe-inspiring." Kendra writes, "I like the variety of textures and contrasting colors, the square edges in the sky. The unusual colors – almost a design like a Nordic (or South American) knitted sweater – are striking in the figure that is at once bird, woman, aurora, a force of nature and part of the sky." Hannah writes, "I chose to interpret Frau Holle as the Woman on the Lake. 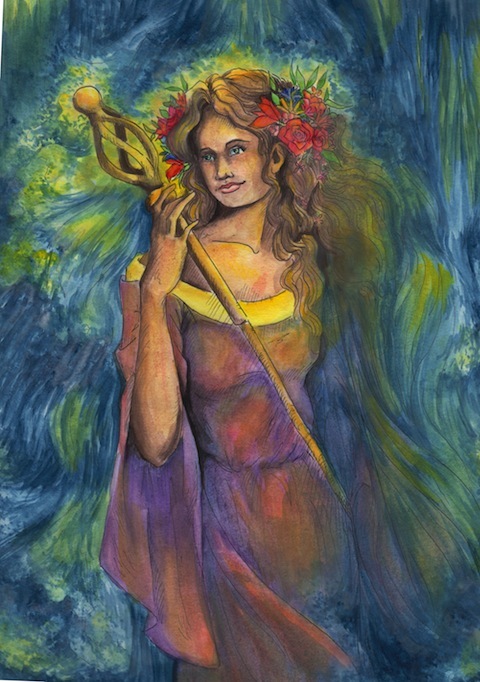 I did some research on her and found some cool information about how she related to spinning, and I decided to give her the staff that she was depicted with in many of the medieval art portraits of her. " This is one of my favorite pieces of all the contests that have been run on this site. I love that Hannah has taken a completely different approach to Frau Holle and avoided the standard image of pillows and snow. This is a uniquely beautiful and inspiring work. Simon says, "I like the combination of clean, defined lines and blended colors in this piece. The addition of the flowers in the hair adds a point of interest which sets the painting off, very well indeed." Kendra comments, "I like the blue and green background that blends with the figure's hair. Interesting to blend Holle and Woman of the Lake – almost a Triton or sea-king figure as well." Susanne writes, "An invocation of an old Goddess: In times of climate change we strongly need the aid of an old goddess of snow and wisdom. With my contribution I am invoking Holle as an intermediary between worlds, so she can guide our journeys. I am asking her to give us clear thoughts – unique like ice crystals – so we can understand what is right. And to let us dive deep into wisdom, so we might act wiser than before. The sigils are four variations of the word truth, developed from the old futhark of runes." 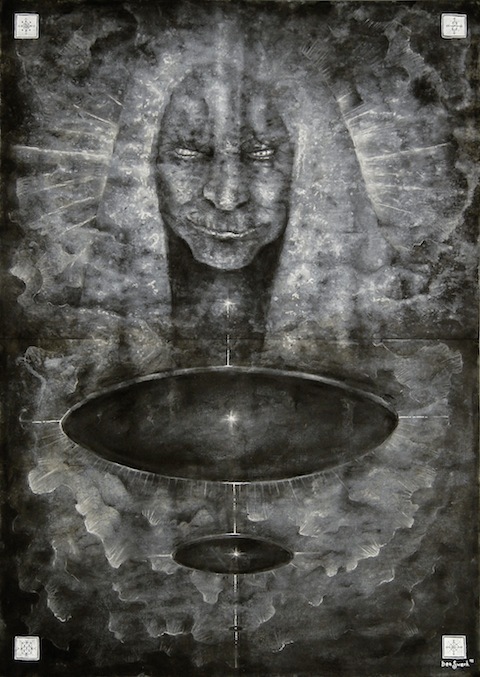 Susanne's work is powerful and mystical. She has managed to capture elements from the folklore that go far beyond feathers and pillows. Absolutely fantastic! Simon says, "This is a somewhat brooding picture, which has both a sense of menace and of wisdom. I like the way the face emerges from the almost abstract textures, making it a rather otherworldy image." Kendra comments, "I like the subtle textures in black and white. The face is haunting – wise and a bit demonic, a mischievous mouth and a determined brow." Love Suzanne's image. LOVE IT. I want to thank once again for the opportunity to participate in the contest. All works are so beautiful. As for me I got much more than he deserved.